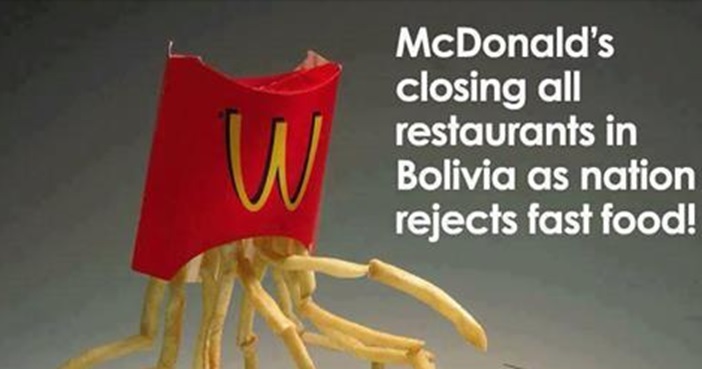 Bolivia became the first McDonald's-free Latin American nation, after struggling for more than a decade to keep their numbers out of 'the red'. And that fact is still making news. After 14 years in the nation and despite many campaigns and promos McDonald's was forced to close in 2002, its 8 Bolivian restaurants in the major cities of La Paz, Cochabamba and Santa Cruz de la Sierra. McDonald's served its last hamburgers in Bolivia, after announcing a global restructuring plan in which it would close its doors in seven other countries with poor profit margins. 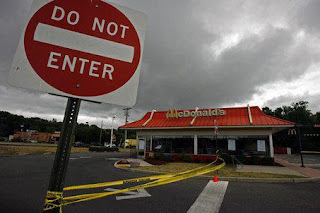 The failure of McDonald's in Bolivia had such a deep impact that a documentary titled “Por que quebro McDonald's en Bolivia” or “Why did McDonald's Bolivia go Bankrupt,” trying to explain why did Bolivians never crossed-over from their empanadas to Big Macs. The documentary includes interviews with cooks, sociologists, nutritionists and educators who all seem to agree, Bolivians are not against hamburgers per sé, just against ‘fast food,’ a concept widely unaccepted in the Bolivian community.